MEET THE BUILDER – This Weekend! The time has come for another “Meet the Builder” event! We love having these events during Parade of Homes and getting the opportunity to talk to people about the custom home building process. Building a new home is an exciting step in your life! Whether it is your first home or your forever home, building custom will allow you to get the layout & design you’ve always dreamed of. The thought of building custom may seem daunting, but that is why we are here to help! We will walk you through every step of the way with seasoned professionals who have been in the industry for years. The process of building a custom home is easier than you think, and you’re not alone if you have questions! That is why we are providing you the opportunity to MEET THE BUILDER! 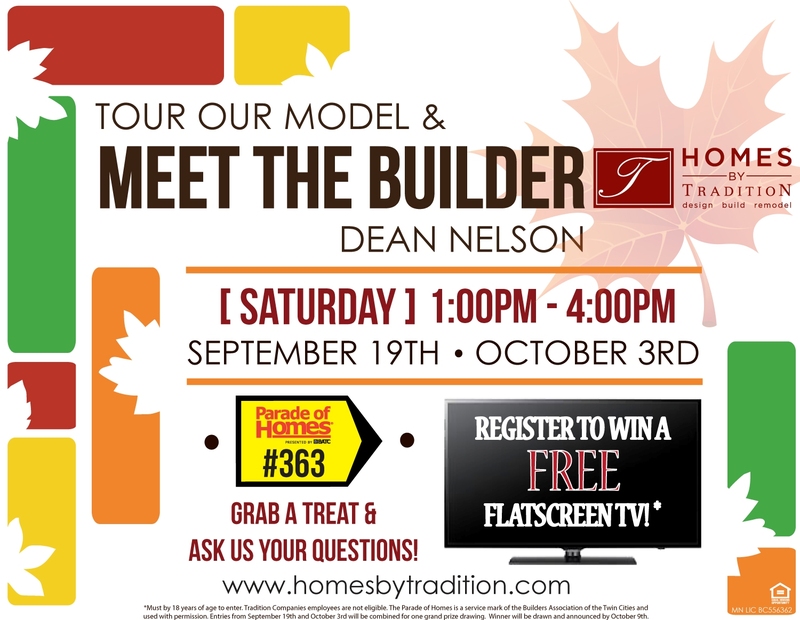 Dean Nelson, President of Homes by Tradition, will be in our model in Lakeville’s Spirit of Brandtjen Farm community to help answer any questions you may have about building a custom home. Whether you’re curious about our process, or just specific parts like concept design or selections, we can help. You can even enjoy a treat and refreshment while taking in the stunning views of our model home.